Pay Per Click (PPC) can help your company achieve great results - fast. Whether you want to promote a new product or service, generate additional leads, or drive incremental sales, PPC should play a key role in your digital marketing strategy. PPC, is one of the most effective digital marketing channels for driving targeted traffic to your website. We help clients who want to trial PPC for the first time, and those that want to achieve better results from their existing account. Keep reading to find out more about our PPC services, and the process we go through to help improve your return on investment. Most people associate PPC with Google Sponsored Ads. You can see these adverts subtly highlighted at the top of Google’s search results when you enter a particular phrase or query. When running PPC on Google Search or Bing, we help research which keywords or search phrases a person has to type to trigger your adverts to show. We then create highly engaging creative, and by sending traffic to specific pages of your website we can help maximise the chances of converting your potential customers. PPC also provides an opportunity to target your audience at different stages of the customer journey. For example, you can target potential customers when they are at the ‘ready to buy’ stage with a specific offer on the product or service they are interested in. When people visit your website, they may not convert on the first visit, especially if they are still researching their purchase. By analysing your analytics, we can help understand trends for certain segments of visitors. For example, some people may add your product to their online shopping cart, but don’t complete the checkout experience. If your website is focused on lead generation rather than online sales the same applies for those that visit your contact form but don’t get past filling in their email address and clicking ‘submit’. With Remarketing, it is then possible to target these users once they have left your website using a variety of platforms, showing them a relevant message, prompt or promotion to attract them back and complete a conversion. We currently specialise in remarketing through the Google AdWords platform, and through Facebook. At Elliptycs, we are a team of award-winning Google Partners. 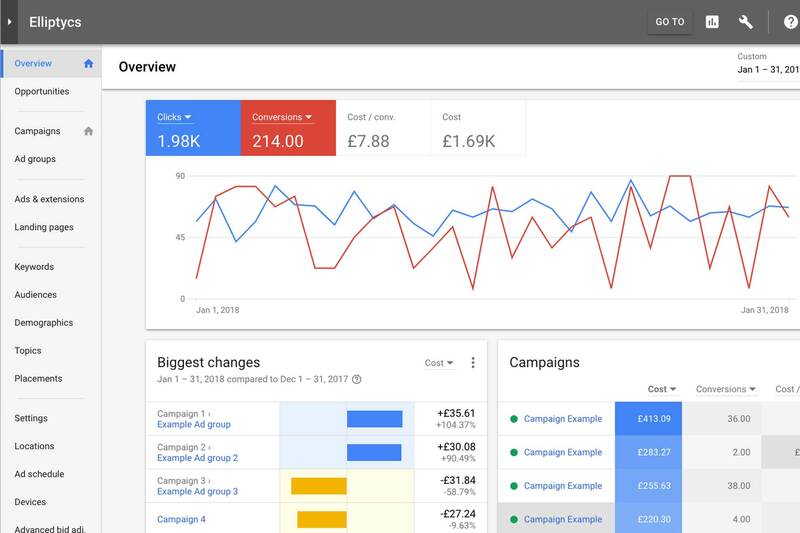 We start by helping set-up your PPC account, and once up and running we constantly tweak and optimise your account with performance enhancements. We believe in being totally transparent. At the end of each month we report on your results, so you know the value and return on investment that PPC is providing. You will also get full access to our project management software, so you can see all the work completed and planned for the coming weeks.